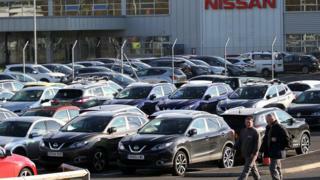 The European Commission says it is in contact with UK authorities after Japan's Nissan said it had been given "support and assurances" over Brexit. Nissan's commitment to its Sunderland car plant, the UK's biggest, had been in doubt following the EU referendum. But after government pledges, Nissan is to build two key models in the UK. "We have seen the press reports regarding Nissan and as a result the Commission... is in contact with the UK authorities," a spokesman said. The Commission spokesman said: "The UK authorities have not notified any support to Nissan for assessment under our state aid rules and we've therefore not taken any formal view of this matter." Depending on the terms of the UK's exit from the EU, Britain may well no longer be bound by EU state aid rules following Brexit. But as long as it remains a member, the UK would not be able to favour particular companies. Mr Clark has insisted that that there was "no cheque book" involved in the assurances given to Nissan.